The United States Mint has never struck a coin for the U.S. Coast Guard but it has minted bicentennial bronze medals for the military branch. Companion Senate and House bills were reintroduced last week to seek gold, silver and clad coins to honor the men and women of the U.S. Coast Guard. The Coast Guard (www.uscg.mil) is one of five military branches in the United States. Founded on Aug. 4, 1790, it has an estimated 56,570 Active Duty, Reserve, and Civilian personnel who maintain navigation aids, provide security and respond to search and rescue cases that save thousands of lives each year. Named the United States Coast Guard Commemorative Coin Act of 2017, the House (H.R.2317) and Senate (S.1021) bills call for 100,000 $5 coins; 500,000 silver dollars; and 750,000 clad half-dollars with designs that are emblematic of the traditions, history, and heritage of the United States Coast Guard. The United States Mint would produce them in collector qualities of proof and uncirculated and offer them for sale during calendar year 2020. The U.S. Mint has never struck a coin for the U.S. Coast Guard but it has minted bicentennial bronze medals for the military branch. It will also issue 2018 World War I Coast Guard Silver Medals to augment silver dollars commemorating the centennial of America’s involvement in the war. 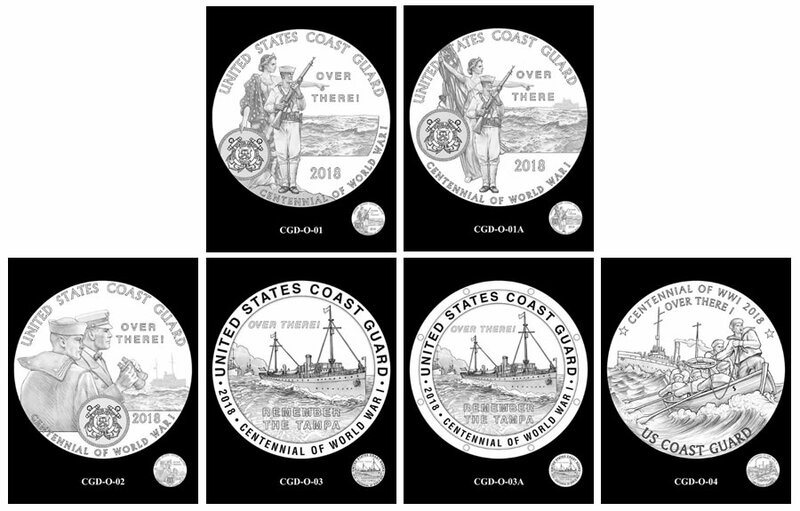 Coast Guard Silver Medal Design Candidates – obverses (heads side). 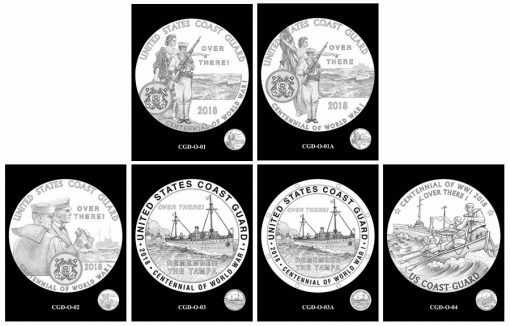 These designs were reviewed in March for the upcoming 2018 WWI Coast Guard Silver Medals. The U.S. Mint will also issue medals in 2018 to celebrate the Army, Navy, Air Service and Marines. The two bills were introduced on May 3, 2017. Congressman Joe Courtney (D-CT) brought forward H.R.2317 while Senators John Boozman (R-AR), Chris Murphy (D-CT) and Richard Blumenthal (D-CT) introduced S.1021. Sales of the commemorative coins would include surcharges for the National Coast Guard Museum Association (www.coastguardmuseum.org) to help finance the design, construction, operations, and maintenance of its museum in New London, CT.
"The brave men and women of the United States Coast Guard represent the only branch of the Armed Forces that is not yet recognized with a national museum," Sen. Murphy said. "We’re trying to right that wrong and just secured an important $5 million down payment of federal funding for the construction of the National Coast Guard Museum in New London. But we need more help." The Omnibus Appropriations bill enacted on Friday, May 5, included the first federal funding for the museum. Versions of the bills were introduced in past sessions of Congress but those died from inaction. For the act to become law, it must pass in the House and Senate and get signed by the President. A good move IMO. The Coast Guard often seems to be low on the radar versus the other four service branches; this recognition’s well-deserved. 230th anniversary – a nice round number and yet still odd. Couldn’t have done it in 1990 for 200 yrs, and can’t wait until 2040 for a 250th anniversary. Wait – I’m sure they’ll do another one in 2040 because Congress can’t help but commemorate the military, beginning, and end of wars. At least they haven’t forgotten the lunar landing, but what about the Hubble telescope? Or the PC? The mouse? Graphical User Interface (i.e. icons?). I guess these major advances in technology don’t deserve recognition in the eyes of Congress. I love this idea, but because of how active the coast Guard is today I wish it was a little more modern and maybe a rescue copter. And leave out the ground force stuff.